Would you like to make more money?? Umm yeah you do! Read on…. Think Outside - Have you been published? Would you like to have your Landscape Projects published? Uh, yeah, me too! Venturing out on your own, or starting from scratch can be extremely intimidating. Nevermind that you’re an amazing designer… where do you even begin? If you are contemplating starting your own landscape design business the basics in Volume 3 will help lay the groundwork for success. As designers we are consumed with making places and spaces pretty for others. We agonize over the details, we pour over the plans, and that often results in neglecting the design of our business. The design of your business is everything from your Business Entity status to your presence online. It is your logo, your company culture, your office and your business systems. In Volume 3 of the playbook we will outline and dive into detail on 10 basics of starting your business. The 10 steps I outlined above don’t have to be completed before you start working. In fact, the very best thing you can do right now is START! Is this list overwhelming? Perhaps. If you are feeling overwhelmed, don’t stress. This is a process that doesn’t happen overnight. You are here reading this information. That means you are trying to educate yourself and better your business. 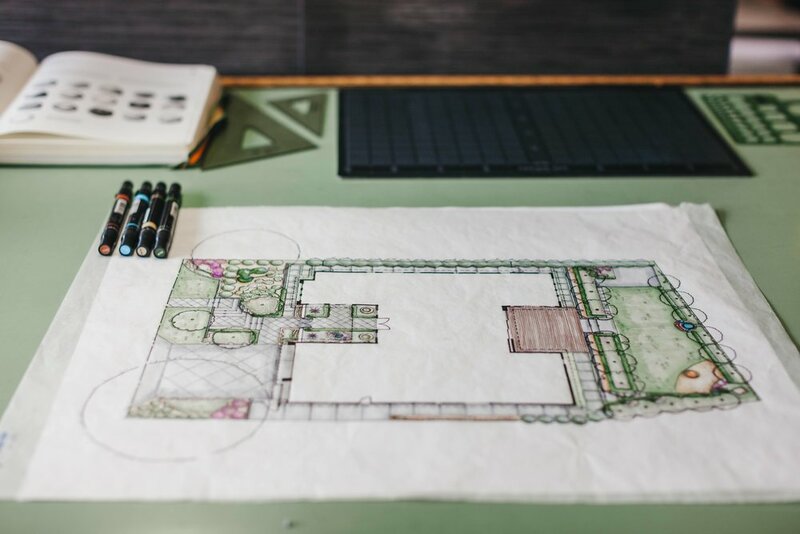 I share business tips and tricks for all things related to the business of Landscape Design in my monthly playbook “Think Outside.” This 15-20 page PDF is full of things I’ve learned during my time in the Business. Click the link below to subscribe and learn how to get your business started. Using photography for your business is important, but as a new professional this can be a bit of a challenge. What if you haven’t done many projects… or what if you’ve NEVER done a project, or perhaps you have sold a few designs but nothing has been built yet. 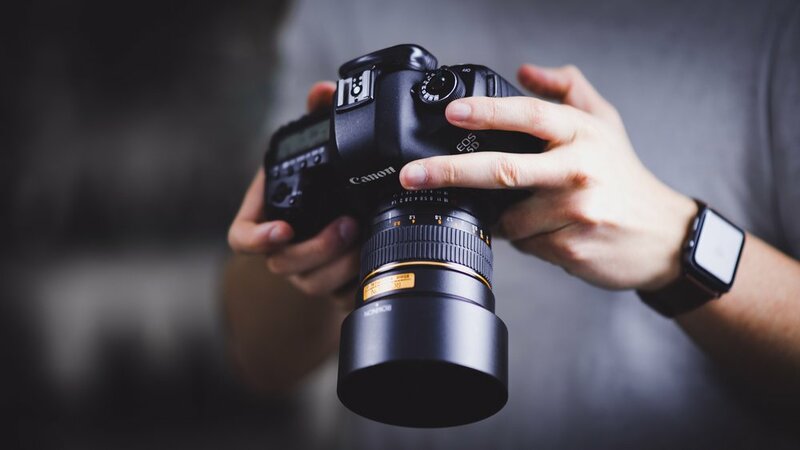 Here are some creative ways to get good photos to use on your website or social media. Create a relationship with a local nursery, garden center, or botanical garden. Offer an exchange of services (your design service for discount or free) for the chance to use the space. Move around plants and other items to create a vignette that you can then photograph. Offer your services to a local contractor for a discount/free in exchange for the right to photograph the project after. Landscape your own home or a friend/family member’s home and photograph it at different times of the year to get several shots that you can use. If you don’t have any projects completed yet, start with a blog. Identify your style and projects you love using social media like Pinterest or Google image searches. Create a blog post using these images to let your clients know your style and vibe. Write about things for which you have an opinion, and remember… never portray someone else’s work as your own. Give proper credit to the authors/creators of the photos. Subscribe here to learn more! 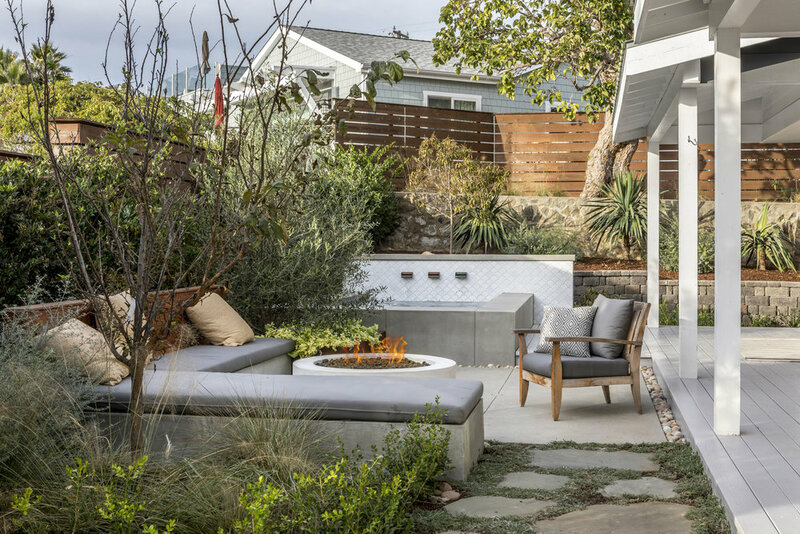 I share business tips and tricks for all things landscape in my monthly playbook “Think Outside.” This 15-20 page PDF is full of things I’ve learned during my time in the Landscape and Design Business. Click the link below to subscribe and learn how to get your business started. Think Outside- Is Hiring a Professional Photographer Necessary? DIY or Hire a Photographer? A picture is worth a thousand words. If that’s true, then in the landscape world, that picture could also be worth $1,000, or how about $100,000? Yep, that's right… one amazing photograph seen by the right person can easily help sell you that 6-figure project. In our experience, quality photography is worth EVERY penny! I can’t tell you how many designers and contractors I know - or have worked with- that do gorgeous work and yet have the most abysmal (read: ugly) photos on their website or social media feed. How is this possible? Is photography too expensive? Are their projects not “photo-worthy”? Did the homeowner let the project go? What other barriers are there to getting good photos? But remember, good photography is an investment. I’ll repeat that… photography is an investment. Your photos live forever. So why would you want to put out into the universe anything but your very best? I ‘be said it before, but 1 good (edited) photo is worth 100 mediocre unedited shots. So, if I could give you one word of advice for your photography it would be HIRE A PROFESSIONAL. I promise it’s worth it. Want to learn more about the landscape business and tips I’ve learned in my 15 years in the business? Subscribe to my monthly playbook, a 15-20 page PDF where I share insider tips and tricks of the landscaping business. Click the link below to learn more! Was this helpful? I hope so! I look forward to sharing more help for your landscaping business both here and in my Playbooks! Do I have ask my client’s permission to photograph their project? Okay, so you’ve finished a couple projects that your proud of and you wanna use photographs for future marketing. First off, that is a GREAT thing to be doing. People love to see past work you’ve done and hear testimonials from happy clients. But you’re probably wondering if you need to get permission from your clients before using their projects for marketing? The short answer is absolutely YES. In general people are private. Many of our clients wish to remain anonymous but are STILL excited about seeing their home and landscape photographed. At FWL, we get asked to NOT use names, and sometimes we get asked to remove address numbers from the photos. On the whole, though, most of our clients are perfectly happy seeing their homes on our site. In fact, over the years I’ve had multiple clients give me a hard time for NOT putting their project on my Instagram or on the website. The truth is… not all projects are website worthy, but that’s a topic for another time! However, it’s very important to get consent from your clients. Verbal consent is nice and all, but do you need them to sign an actual form? On our construction agreement we have a clause allowing us exclusive access to photograph the construction process and the final product. This clause allows us to use the pictures on our website, social media, and really any other source we like. EVEN with that clause we would still make the client aware and make sure they have no reservations about their home being photographed. Learn more about photography and how to use it for your business in my playbook ‘Think Outside”! A monthly 15-20 page PDF where I teach you tips and tricks of the landscaping trade. Whether you’re new to the business or been in landscaping for years there’s something for you. FWL offices in Solana Beach, CA. Okay, so you’ve decided to launch off on your own… you’re ready to build your clientele and get started with your projects! You know you need to market yourself to grow, but not sure how? I’ve got you covered. I started my landscaping business over 12 years ago on pretty much nothing, during that time I’ve learned some of the best ways to market myself while still staying within my budget! Three ways to market yourself without blowing your budget! Identify ways to “Wow” your clients. Set up a system that reminds you to contact your clients on the project anniversary “just to say hi”. People love personal touches, if you deliver a relationship not just a service people will be more likely to recommend you to a friend. And word of mouth marketing is the best kind, FREE! More ways to MARKET ON A BUDGET will be in my playbook ‘Think Outside”! A monthly 15-20 page PDF where I teach you tips and tricks of the landscaping trade. Whether you’re new to the business or been in landscaping for years there’s something for you. Was this helpful? I hope so! Are you looking for unique ways to add more greenery to your design? If you’re reading this, chances are you’re a big fan of all things green. Plants are a great natural way to add color and life to any space. Living Walls are a great way to add more plants and decor to your design. They have been the rage over the past 10 years. If you’re like me, you have tried a few of the various systems out there. Most of them are cost-prohibitive and extremely maintenance heavy. Hanging air-plants (Tillandsias) I love using hanging plants to fill otherwise empty space. It adds life and color to places that often unused. Plus its an easy way to give your project a modern look. Staghorn ferns are the perfect plant to use if you’re looking for a more artistic approach to your design. I love these plants because they each look different, bringing a unique and warm design to any home! Structural looking branches from Manzanita trees are another great way to use plants as art in your design project. Using just a single brand from this tree is perfect for any outdoor project, bonus they are easy to take care of! For more ideas of how to add depth and texture to your designs subscribe to my exclusive playbook “Think Outside”. A 15-20 page PDF where I’ll be sharing how I grew my own business and tons of tips I learned along the way! Think Outside- Should I Have a Design Fee Minimum? If you’re a new Designer, figuring out what to charge for your time can be tricky, there are so many variables that can affect your rates. If there is one thing I have learned over the last 10+ years… you have to have a design fee minimum. Why? In the beginning stages of growing your business you might be willing to take some projects that don’t pay as well for the purpose of building your brand and clientele. But you can’t give away your time forever! Hopefully you have come to a point in your business when you’re too busy to accept every job that comes your way. At this point it would make sense to set a minimum for future projects. This is when you can ask yourself two simple questions. For more about this topic, including questions like “how do I set an hourly rate?” subscribe to my playbook “Think Outside” below. This is a monthly 15-20 page PDF where I share business tips and tricks of the landscaping trade for both new and seasoned professionals!